The calendar of events, and details of this coming March’s Beginner’s Course, have now been updated for 2019. We had a very successful year in 2018, with healthy colonies in the branch’s two teaching apiaries, a good harvest of honey, and an even better ‘crop’ of new and beginner beekeepers joining us. Fingers crossed that 2019 is equally successful. Best wishes for the year to all our members and Friends. This entry was posted in Membership, Monthly meeting, News - local, Training & events on 24/01/2019 by whbbeekeepers. This coming Saturday the monthly meeting will be in our ‘winter quarters’ at Herne Mill, starting at 2.30 pm. As this is also the time of year when we hold our AGM, the meeting will be in two parts. The AGM itself will start at 2.30 (papers will be available on the day) and will probably last for about 45 minutes. You will see from the papers that we will be asking members and friends for suggestions relating to spending some of the branch funds in the coming year, so please come prepared to contribute ideas. Following that, and with some refreshments to hand, we will have a session on ‘Equipment you don’t need’. 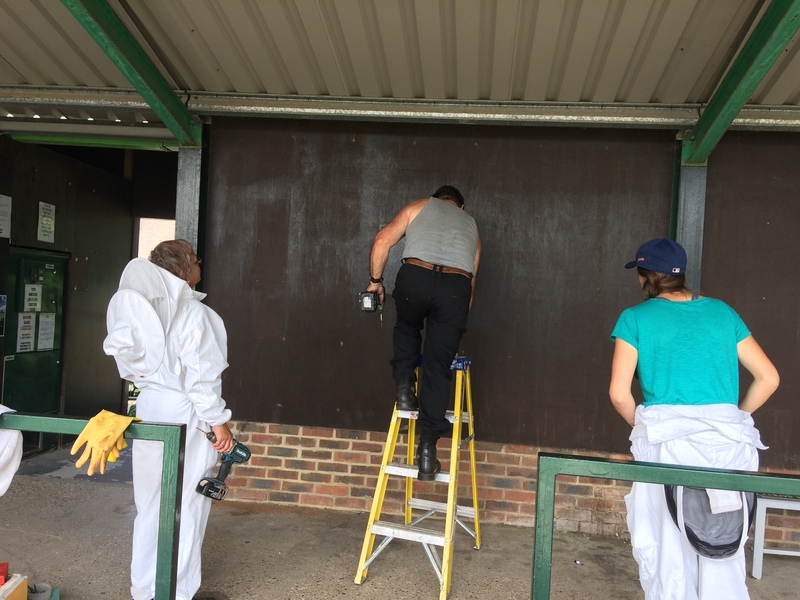 For this, we would like all active beekeeping members of the branch to bring along (if possible) an item of equipment that they’ve bought/acquired at some stage in their time as a beekeeper but then found that it either wasn’t necessary or didn’t work as anticipated. It is recognised that everyone has different ways of working with their bees but we hope that this session will draw out some interesting and useful pointers for our beginners and novices (as well as causing nods of agreement – or disagreement – from fellow beekeepers). We expect the meeting as a whole will finish around 4.30. Please note that parking space inside the Mill’s grounds is fairly limited, so if you arrive just before the start of the meeting it’s usually a good idea to park in the side road next to the Mill. This entry was posted in Membership, Monthly meeting, Training & events on 02/11/2018 by whbbeekeepers. 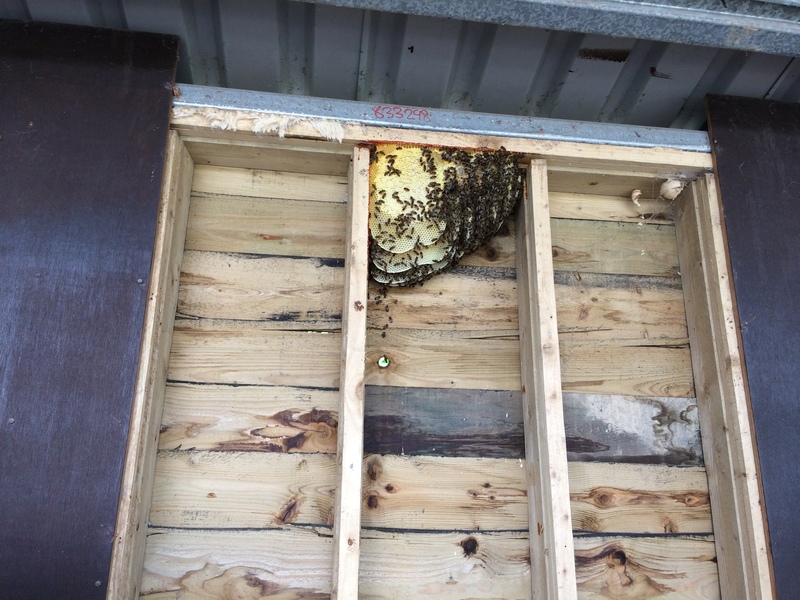 Back in July, during the very hot period a couple of weeks ago, the Boughton golf course found that they had some inappropriate guests in the wall of one of their sheds, behind the cladding. They contacted the branch to see if we could remove them to a safe place. This club seems to be a magnet for swarms and feral colonies as we’ve had similar call-outs for the last couple of years. Anyway, despite the tropical temperatures, some stalwarts from the branch went along and got kitted-up, and carried out what is technically known as ‘a cut-out’ from the wall of the building. It was a nice little colony that obviously hadn’t been there very long, going on the colour of the comb and the small space they were occupying. 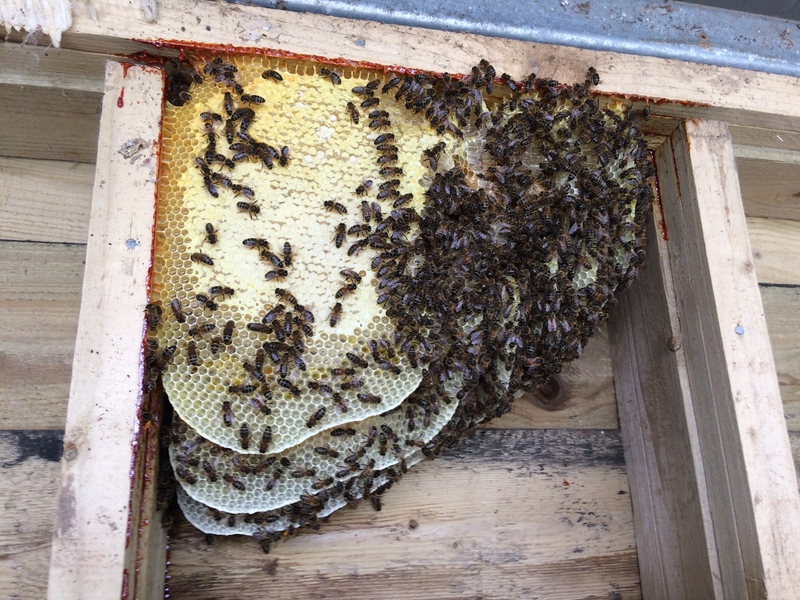 The bees have been put safely into a nuc and the beekeepers are now recovered from their exertions. A nice small colony, that will do better in a proper home and away from the developing wasp nest in the adjacent section! The amount of stores in the front comb is quite impressive, given the short time they’d been there. This entry was posted in How to, News - local and tagged advice, bees and their little ways on 05/08/2018 by whbbeekeepers. A one-day event for members of the public who would like to know more about honey bees and beekeeping, either to see if they might wish to become beekeepers themselves or simply to learn a little about such a fascinating activity. To be held at the branch’s training apiary on the University of Kent campus at Canterbury. We will start the day at 10.30 in the potting shed/training room where the W&HB branch Education Officer, Julie Coleman, will give a couple of hours instruction on the theory of modern beekeeping, together with some practical tips. This will be interspersed with some hands on practical work and plenty of tea and coffee. At 12.30 we will break for lunch: we can provide tea, coffee, cold drinks, and biscuits. but please bring a packed lunch. After lunch, about 1.30 we will suit up in protective clothing provided and go into the apiary to look at the hives. You will be required to bring wellingtons or similar – something the suit can tuck into so there are no gaps, and marigold type washing up gloves. A long sleeve shirt may also be advised as bees can occasionally sting through suits. There will be several experienced beekeepers on hand so we can split into small groups where we can demonstrate handling bees and you can have a go if you wish. We will then retire back to the shed where you can enjoy a hard earned cuppa and we can answer any questions and discuss the way forward if you decide beekeeping may be of interest to you. We should finish by 4.00 depending on how the day goes and the number of questions we have along the way. Beekeeping is a complex and fascinating pastime and there are always more questions than answers and always at least three answers to any question. We have decided to levy a £10 fee for this event, payable on the day. If you wish, we can use this for you to become a Friend of the branch when memberships renew at the end of September. You will receive newsletters detailing monthly meetings and notices of events including our winter programme. You will also be able to attend our apiary inspections with Keith, our apiary manager, on Friday or Saturday mornings. If you decide not to continue we will take the £10 as a donation to branch funds, so we will be able to purchase more protective clothing for similar events in the future. You can upgrade this to full membership when you have bees of your own and have completed our Beginners’ Course. The branch will be offering a full Beginners’ Course in September 2017, with further details to be confirmed nearer the time. Anyone interested in this event should contact the Branch Secretary, Amanda Lee-Riley as soon as possible, via the contact details shown on our ‘About us’ page, shown above. This entry was posted in How to, Membership, News - local, Training & events on 13/07/2017 by whbbeekeepers. ‘It’s a bee’ – but what sort of bee? Most beekeepers will be familiar with someone (often a non-beekeeper) asking for help in identifying a bee that has been seen in their garden. The Bumblebee Conservation Trust has a lot of helpful information on their website on the differences between the various species of bumbles as compared to our honeybees. This page – http://bumblebeeconservation.org/about-bees/faqs/honeybees-vs-bumblebees/ – goes through some of the most obvious differences and is a useful place to recommend for information. When it comes to identifying a bee that is obviously not a bumble but not a honeybee either, then two websites have particularly useful guides: the Wildlife Trusts’ page at http://www.wildlifetrusts.org/reserves-wildlife/guide-solitary-bees-britain and the Grow Wild page at https://www.growwilduk.com/content/everything-you-need-know-about-solitary-bees provide very readable information on the 250+ species of solitary bees in the UK. This entry was posted in Uncategorized on 03/05/2017 by whbbeekeepers.